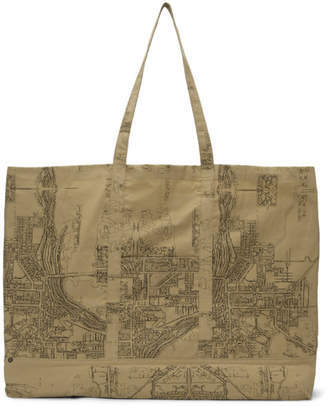 Cotton ripstop tote in khaki. Graphic printed in black throughout. Twin carry handles at top. Text woven in black and white at adjustable and detachable webbing strap with lanyard clasp fastening. Patch pocket at face. Zippered pocket at interior. Silver-tone hardware. Tonal stitching. Approx. 22 length x 17.5 height x 8 width.